Recenty, USA Today published an Opinion piece by Mary Zeiss Stange titled “Homeless on the Range” that has those familiar with actual statistics regarding horse slaughter, abuse, neglect and abandonment deeply disturbed. In yet another example of the American mainstream media presenting articles that contain serious flaws and unsubstantiated allegations, at least in this instance USA Today covered their butts by refusing to cite this as a “news article” because obviously, even they couldn’t swallow trying to pass this piece off with any credibility, despite its very deceptive official “news” format. Though clearly labeled in the Opinion section, “Homeless on the Range” presents ethical media questions just as disturbing as official “news” stories, which too often these days are little more than fronts for lobbyists who have entrenched themselves in every facet of American culture and nowhere has this fact been more glaringly apparent than the media’s coverage of horse slaughter and abandoned horses over the last few years! While others continue to fight the corporate giants stranglehold on distributing honest information, the big question is now aimed at USA Today’s journalistic integrity and ethical responsibilities for allowing and approving of such a distorted “opinion” dressed up to look like it was steeped in facts. How far can or should an official news source of this magnitude be allowed to go regarding the “Opinions” they print? Our Constitutional rights certainly guarantees each and every one of us an opinion and the right to express it. How do we as a Nation, balance the absolute necessity of preserving our rights of free speech and the exchange of free ideas in context with abuse, distortions, extremism, fanaticism and zealotry? Adolf Hitler’s “Mein Kampf – Book I” was a stunning piece of well-articulated literature that extolled the “reasonable virtues” of natural selection and helped fuel his spectacular ascent to power, as the distorted principles of the white race and specifically, the German peoples absolute superiority, became the creed of their Nation. Historical perspective allows us to clearly see the ocean of blood this abomination was responsible for, yet how easily it was embraced by the German people at the time. One of the checks and balances Americans depend on for allowing both freedom of speech while simultaneously regulating the fanatical fringe is a dependence on our media to exercise some measure of journalistic integrity in what they print, even in their “Opinion” sections. Would USA Today have printed Hitler’s “Nation and Race”, extolling its “reasonable virtues” as well, if those in charge today found themselves in charge back then? Today, Iran’s official position is, “The Holocaust never happened” with its leaders teaching the Iranian people this “fact”, despite unprecedented volumes of documentation that unquestionably prove - to mankind’s shame – indeed, it did. Would USA Today print their “opinion” as well? Can we expect Neo-Nazi opinions, gay bashing, promotion of the “virtues” of child molestation and God knows what else to also be allowed in an American newspaper distributed coast to coast and representing us to the world at large? Is this the state of the USA Today? While I cannot morally support a boycott on someone expressing an opinion as Ms. Stange has done, I can support a boycott of the editors in charge, who have lost their way as to what constitutes journalistic integrity, responsible oversight and with whom no other reasonable explanation can be found for their support of an opinion piece such as this besides seeking to appease their Corporate Lords. There is also another popular American motto that is particularly well suited to addressing what USA Today has done and its called “Garbage In – Garbage Out” and this article has shown us where this “newspaper” needs to go from now on – in the garbage! Exactly!!! USA Today belongs in the garbage. I couldn't have said it better! The article was a piece of trash, steeped in pro slaughter propaganda and rather than in the news media, it belongs in the trash. I will consider the source of information coming from USA Today (as well as some other news sources) when I read and send the trash to where it belongs from this point forward. Having read other non-factual, non-researched articles and just plain lies from those pro-slaughter on, i.e., "abandoned horses," "starving/neglected/abused" horses, this one hit me with an unbelievable whammy. There is just one word for this article: WHACKO!" The author, Ms. Stange, was not "misinformed." WORSE!. A Prof. with a Ph.D, chose to grossly twist the facts, to put in mildly. And might I respectfully add, ((((LIE!!!)))!!!! But this is understandable. Some will sink to low-levels and gibberish when faced with fear and loss of money. Money is powerful. She mentions the just introduced, "PREVENTION OF EQUINE CRUELTY ACT," HR6598. Mentions. However, this is the manifest focus of all her musings in this article. Meaning, read-between-the-lines. Pro-slaughter knows this bill will be passed. And there goes the $$$$>>>>. Like the last gasp, this article is grasping at straws. Yes, it is a time of economic stress. However, we have been here before w/o so-called massive reports of "abandoned horses." And although some horse owners do fall on bad times, it is the responsibility of all horse owners/breeders, to THINK BEFORE purchasing horses, if they have the mental, physical, emotional and financial resourses to care for their horses, no-matter-what. Horse ownership is not to be taken lightly. A minority of her references to support her arguement are taken from well-known pro-slaughter, monied organizations that profit from the slaughter of horses: American Quarter Horse Assoc. (AQHA), American Horse Council (AHC), Horse Welfare Coalition (HWC), Cattlemen's Assoc., American Veterinary Medical Assoc. (AVMA). Yes, even the AVMA...notorious for major animal cruelty. For the AVMA is pro-horse slaughter, for factory farming w/the multitude of abuses, intense suffering, conscious butchering as is the norm in horse slaughter. Lastly, although this article is so upsetting in the aspects formerly noted, it was humorous in that the author used most of her references from anti-slaughter web sites to back-up her points. I imagine she could not find, and/or not make the effort, to research references from unbiased or pro-slaughter sites. But this is a good thing. For, now readers are directed to anti-slaughter's most major, reputable web sites. Now readers can read the well-researched, documented, statistical truth when using her links. Counterpoints to her "points." And! Once linked into the anti-slaughter web sites (thank you Prof.), the reader will now be able to *see the *photos/*videos of horses suffering the immense brutality of auctions, kill buyers, transport for days crammed w/o food, water, and the fear,screams as the butchers slaughter our American horses. "A picture is worth more than a thousand words!" Shame on you Prof. Stange. My condolences to your college students. Talk to your Peruvian, Amante...you will hear good "horse-sense." USA TODAY! More than shameful. You have AGAIN lowered your standards. Your credibility is more than compromised. This has happened one time too many. Never again will I purchase your "news" magazine. I want reporting with integrity and intelligence. I can pick up a Tabloid for junk and over-the-top unreality. But then again, USA TODAY is now reduced to that level. I wrote to USA Today and received a reply that told me they would look into it and let me know if they needed any other information. Needless to say, I did not hear from them again. After that article, I could never again trust USA Today to give me factual news. As I told them in my letter, I am not as well versed on every subject in the world, as I am about horse slaughter. I knew the article to be packed full of lies, but how would I know if their other articles were truth or lies? I wouldn't. I will never trust that paper again. If these idiots are so addamant about disposing of abandoned horses via the meat industry, why don't they reopen Auchwitz and send all the homeless people there! Great idea, huh? That way they would not be a burden on society, and we could save millions on tax money that goes to support those bums!! That makes about as much sense as your #### article. Who created the excess horse problem - people of course! Dr. Strange's research on the subject of horse slaughter appears to have been limited to watching old Kirk Douglas movies, reading Oren Dorell's earlier USA Today article US shelters saddled with unwanted horses (March 2008), and googling a few pages on the internet. Strange's distain for the tedium of fact checking was clearly demonstrated by her inclusion of a quote from Dorell's article attributed to Julie Caramante. Dorell had already apologized for committing the huge journalistic no-no of incorrectly attributing the statement to Caramante with whom he had never spoken. Dr. Strange opens with a subtitle claiming that horses are being abandoned in the thousands. But instead of offering some evidence in support of this statement (and there is none), she goes on to claim, "The single overriding cause of surplus horses is the movement to ban the sale of horses or their meat for human consumption." While Strange later mentions that more horses are being sent over the borders to slaughter in Mexico and Canada, she skillfully avoids the embarrassing fact that these increased exports have resulted in more American horses being slaughtered this year than before the plants were closed. According to the USDA, through June of this year we sent 65,899 horses to slaughter as opposed to only 63,650 for the same period of 2006 (the year before the closures). This unfortunate statistic entirely belies the Strange claim of causation for all the supposedly abandoned horses. There is no documented evidence that horse abandonment is epidemic or even significant, and there is presently no lack of a "slaughter option" for owners who wish to betray their equines with a tortuous trip to brutal slaughter. Unsubstantiated statements run through Strange's article like the abandoned horses galloping through her furtive imagination. Even when she sites valid data, Strange manages to misquote it. For example, she claims "There are, to begin with, too many horses in the USA: 9.2 million as recently as 2005, up from 5.3 million in 1999". These numbers imply that the horse population nearly doubled in just 6 years, but while the 9.2 million figure is correct for 2005, the 5.3 million figure (actually 5.25) was from an American Horse Council study done in 1986, not 1999. The actual period of this increase was 19 years, not 6, but this is hardly the kind of explosive growth that makes sensational scare journalism. Even when Strange uses real data to make her points, she carefully cherry picks it to support horse slaughter. For example, she points out that the AHC study found a third of all horse owners had an annual income of $50,000 or less, inferring that many horse owners cannot afford to take care of their horses. But this figure includes people in many situations that allow them to take very good care of a horse for very little money including people who live in rural settings and own land with good grazing. Strange carefully avoids a more telling economic statistic from the same study. The study estimated that the American horse industry earns about $141 billion dollars a year either directly or indirectly. When one considers that horse slaughter industry is estimated to pay horse owners only about $40 million dollars a year, we are left with the fact that horse slaughter represents only about 0.03% or one third of one tenth of one percent of the income horses generate. A postscript to the article claims that in 2007 the Unwanted Horse Coalition estimated that 170,000 abandoned horses lived in the United States. Contacted about this estimate, the UHC said they had no knowledge of where this quotation came from and that they had no such data. This misquote is followed by several press reports as proof of this epidemic of abandonment and neglect which according to Strange was the result of the closing of the US based slaughterhouses. It took little investigation to prove that these examples were as flawed as everything else in the Strange article. One example references the case of Francine Derby who had 120 starving equines seized from her Central Florida ranch in May. The Derby story was about a long term case of hoarding and had nothing to do with the current situation or the closing of the slaughter houses. 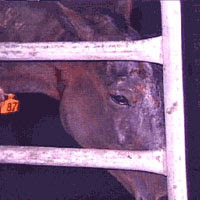 Morgan Silver, executive director of the Horse Protection Association of Florida, stated that she filed a police report on the deplorable situation with Derby's horses back in 2003, four years before the first plant closings. At that time, Derby already had over 100 equines, mostly ponies and minis. And as to the pretense that Derby was a "rescuer", she had 45 stallions and was breeding the animals according to Silver. Another example given to prove the dire consequences of having closed the US plants states, "It is estimated that 200 of 1,200 wild horses overpopulating the Virginia Range near Reno, are actually "strays." Many won't survive in the wild, and the mustangs could be at risk of disease from domestic horses." Attempting to add her own spin to the story, Strange breaks new ground by streamlining the ancient and laborious process called Chinese Whisper Syndrome in which a story is repeated countless times until it bears no resemblance to the original. Strange uses her rigorous abstinence from fact checking to accomplish the same result in a single repetition. The quote Strange sites is from the Las Vegas Review Journal, but it is not "200 of the horses in the Virginia Range". The quote, attributed to Nevada's Agriculture Director Tony Lesperance, read, "although people refer to the 200 horses in the Virginia Range as wild horses, they technically are strays -- horses that may have been set free by their owners." The Nevada Department of Agriculture has long contended that all 1200 (not 200) Virginia Range horses are "strays" and that is undoubtedly what Lesperance said or meant to say. This does not mean any of them were recently abandoned. They have been there for a very long time. The NVDA calls the horses "strays" because they do not belong to the original Spanish horse bloodlines (Ironically, the Spanish horses were also "strays", but that is another story). The importance of this distinction is that the Virginia Range horses are not protected under law as "mustangs", thus freeing the hands of the NVDA to dispose of the horses as they please. Craig Downer, a wild horse expert who monitors the Virginia Range horses, says that no recently abandoned or stray horses have been detected in the herds. He adds that far from starving from overpopulation, the Virginia Range horses are thriving. In a single paragraph, Strange both proves Moynihan's observation about mistakes only a PhD can make and creates a new entry in the lexicon of journalism that I predict will forever be known as Strange Whisper Syndrome. So why do writers like Strange, Dorell and many others keep pumping out these fallacious attempts to defend horse slaughter? One has only to read the animal agriculture trade journals and magazines to understand what is really going on. The assault on the anti-horse slaughter legislation is nothing more than a proxy war against animal welfare organizations and the so called "animal rights" movement. The motivation for this assault is the belief that such a law would be a victory for the welfare groups and a step onto a slippery slope that might lead to other animal protection legislation. As in all wars, the innocent (in this case the horses) are the victims. The paranoia runs far deeper than the horse issue. Cattlemen at a recent Texas A&M seminar were told that recent video documentation of the incredibly inhumane treatment of "downer" (non-ambulatory) cattle at a California slaughterhouse was just the first step toward stopping the slaughter of cows, pigs, sheep and goats. And why might Dr. Strange, the author of Woman Hunter, coauthor of Gun Women and author of the pending book Sister Predators be motivated to join a proxy war against animal welfare organizations? One can only ponder such mysteries, but we might have expected that with fifty years of experience as a Montana hunter and journalist, Strange would have thought to bring some ammunition to this war. Obviously, the writers of this propaganda cannot simply say, "we think you are after our cattle and pigs, so we are not going to let you protect the horses." Instead, they make up tales about a plague of abandoned and unwanted horses and pretend to care about the horses as they drive their fiction home in article after article. So why should the average American care about this dirty little proxy war? The answer is as simple as it is profound. If we cannot trust publications like the USA Today to tell us the truth on this subject, how can we trust them on any other? Facts? Facts? We don't need no stinking facts! John Holland is a freelance writer and the author of three books. He frequently writes on the subject of horse slaughter from his small farm in the mountains of Virginia, where he lives with his wife, Sheilah, and their 12 equines. Holland serves as senior analyst for Americans Against Horse Slaughter, an organization composed entirely of volunteers. As always, Texas Horse Talk welcomes dissenting opinions. Send your comments to news@texashorsetalk.com.